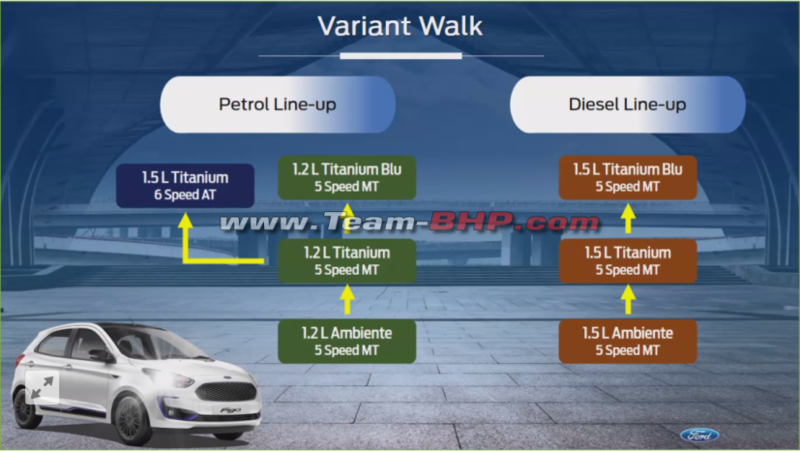 As per the leaked data, the 2019 Ford Figo facelift will be offered in three primary variants - Ambiente, Titanium and Titanium+. The car will share its cues with the facelifted Aspire. 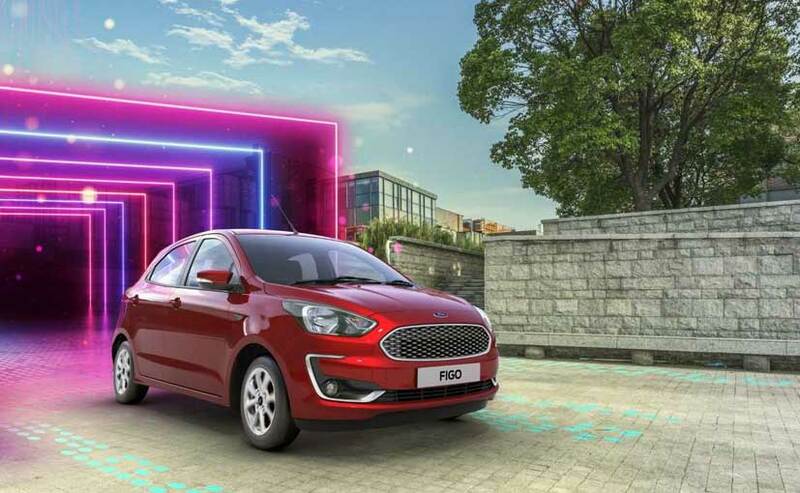 The 2019 Ford Figo is all set to be launched in India on March 15 and the company has already revealed the updated model. Now, just days ahead of its launch variants and other features and specifications of the car have leaked online, giving us more information about the car. The car will borrow several of its visual cues, and powertrain options from the already on sale Ford Aspire facelift, but the variants are slightly different as now the car will come in 3 trim options Ambiente, Titanium and Titanium Blu, replacing the usual seen Titanium+ variant. Powertrain wise, the 2019 Ford Figo facelift will come in two petrol and one diesel engine option - the new 1.2-litre and 1.5-litre three-cylinder petrol engines and the tried and tested 1.5-litre, four-cylinder oil burner. The smaller 1.2-litre petrol engine offers 95 bhp and 120 Nm of peak torque and the 1.5-litre petrol unit develops 123 bhp and 150 Nm of torque, while the 1.5-litre diesel unit makes 99 bhp and 215 Nm of peak torque. Transmission duties will be handled by a 5-speed manual gearbox for the 1.2-litre petrol and 1.5-litre diesel model, while the 1.5-litre petrol unit comes mated to a 6-speed automatic torque converter as standard. On the features front, the Ambiente trim of the Ford Figo facelift comes with offerings like a new black mesh grille, body coloured front and rear bumpers, black ORVMs, rear foglamps with black bezels and 14-inch wheels. The cabin, on the other hand, comes with charcoal black interior, fabric upholstery, map pockets at the back for front seats, passenger vanity mirror, and 12V power socket up front. Other offerings will include a manual AC, tilt adjustable steering, Day/Night IRVM, front power windows, electric boot release, and electric power steering. On the safety front, the car comes with dual front airbags, ABS + EBD, rear parking sensors, driver and passenger seatbelt reminder, speed sensing door lock function. Adding to the features offered on the Ambiente trim, the Titanium variant comes with a silver painted grille with chrome surround, front foglamps with chrome bezels, body coloured electrically operable ORVMs with turn indicators, blackened B-pillar, rear defogger, and 14-inch alloys. Similarly, the cabin comes with add-ons like a rear parcel tray, an adjustable headrest for the rear seat, height adjustable driver's seat, and chrome tip for the hand brake lever. In terms of features, the car is a lot more loaded offering a 7-inch stick-out touchscreen infotainment system with navigation, along with 4 speakers and Bluetooth AUX-IN and USB connectivity. The Titanium trim also gets features like - a rear-view camera, keyless entry with engine start-stop button, automatic climate control, steering-mounted audio controls, gear shift indicator, tachometer, rear power windows, and one-touch up/down driver window. 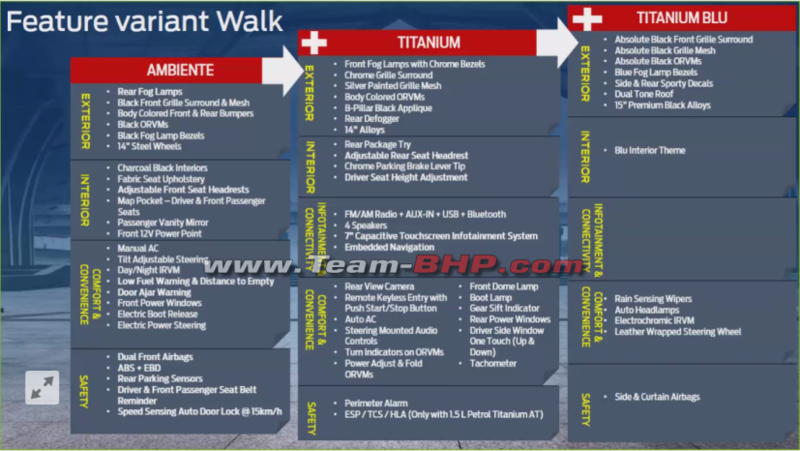 On the safety front, the car comes with perimeter alarm, while the 1.5-litre petrol trim, which will only come in the Titanium trim, will get ESP, TCS, and HLA as well. The new top-spec Titanium Blu variant gets additional features like - black exterior treatment featuring an absolute black grille with black surrounds, absolute black ORVMs, blue foglamp bezels, side and rear sporty decals, dual tone treatment with contrast roof, and 15-inch black alloy wheels. The cabin will feature a 'Blu themed' interior, along with features like rain sensing wipers, auto headlamps, electrochromic IRVM, and leather-wrapped steering wheel. The Titanium Blu variant also gets six airbags in total, including side and curtain airbags. Upon launch, the Ford Figo facelift will continue to rival the likes of the Maruti Suzuki Swift and Hyundai Grand i10.